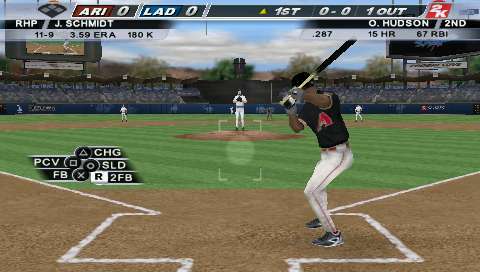 I met with my good friends Anthony (from 2K Sports) and Katie (from Access PR) yesterday and they showed me Major League Baseball 2K7 on Xbox 360 and PS3. It's going to be available on everything except GameCube and Wii (they would have had to create a whole new control system and couldn't do it in time for the season) and it will ship in the first week of March 2007. i was pretty impressed with it. Overall, the graphics and sound are great. The details are all there, from Inside Edge statistics that affect AI on a play by play basis, to 150 signature style individualized player animations, and even to shirts rippling in the wind and little puffs of dirt coming up from player's footsteps. The commentary was reasonably interesting, at least for the few innings that we played. The heckling "Hey, I stole your girlfriend Jeter") was pretty cool. Pitching controls remain the same, using the "Payoff Pitching" system and now you can even control the catcher and have him call the game. Hitting is the same using the swing stick. On PS3 you also have the option to swing using the controller due to it's 6-axis motion sensing capability. I couldn't get the hang of this during the brief time that I had with the game. They reworked a lot of the fielding so that momentum when running seems more real than last year. They also revamped every stadium, including lighting down to the way that shadows affect hitting. The PIP baserunning makes it easy to control runners. There is online play with online leagues for both Xbox 360 and PS3. Also new is the ability to manage your budget and set ticket prices in franchise mode. 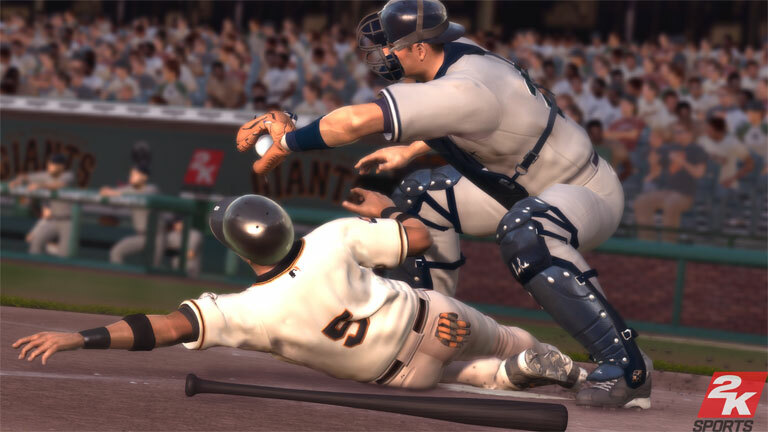 â¢ Signature Style - Player-specific batting stances, waggles, home run celebrations, step-ins, step-outs, windups and deliveries bring each player to life like never before. â¢ True Fielding - Fielder positioning, relay and cutoff A.I. has been redesigned to allow for better, more authentic Major League defensive play. Defensive alignments are now based on who is at the plate. â¢ Dynamic Throwing System - Responsive throwing mechanics coupled with unique animations for infield, outfield and situational throws brings your command of the ball to a new level. â¢ Inside Edgeâ¢ - Updated for the 2007 season, Inside Edgeâ¢ data is now tied into USER control at the plate. Playing into your pitcher's or hitter's strengths will now reward you with a boost in hitting power. â¢ Next Generation Player Models - 2K7 player models are brought to life with exquisite accuracy. Now body type, player faces, accessories, uniforms and hats match their real-world counterparts down to the minutest details. â¢ Franchise Finance - Team news, attendance, ticket prices and fan âbuzzâ will all play a key role in the success of your franchise. Each of these elements can affect your seasonal profit or deficit, affecting budgets for subsequent seasons. â¢ Unprecedented Commentary - All-Star duo Jon Miller and Hall of Famer Joe Morgan return to the broadcast booth to deliver the best commentary in the business. â¢ Hi-Def Baseball â Seamless camera work, new crowd audio and stunning replays keep you in the moment through the duration of a game. â¢ 2K Sports Online Play â Go head-to-head and compete in leagues and tournaments against the best players on the planet. â¢ Soundtrack â Nirvana, Sublime, The Stooges, Pixies, 311, The Specials, Tapes ân Tapes, DFA 1979, Thermals dnd more.